The United States is heavily reliant on nuclear power for its electricity. Last year, six states used nuclear power for more than 45 percent of electricity generation, with 19 percent of the nation’s electricity generated by nuclear reactors. As current U.S. nuclear energy production facilities increasingly approach the end of their planned operational lifespans, an innovative approach around Small Modular Reactors may represent the best and most practical solution available to energy decisionmakers. While solar, windpower and other renewable energy sources are becoming more prevalent, they are still decades away from becoming viable alternatives to nuclear for most Americans. 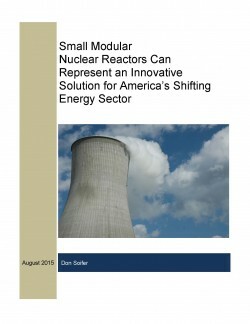 Federal regulatory officials have made important progress modernizing their systems and requirements for approving advanced reactors, a process expected to continue at both federal and state levels, and one which will largely define the future cost-effectiveness of the Small Modular Reactor approach. In particular, plans and requirements for the safe disposition of spent nuclear fuel from new reactors will be crucial. Potential benefits of Small Modular Reactors include cost effectiveness, grid resilience, and improved safety and energy diversity. This entry was posted in Energy, Studies. Bookmark the permalink.